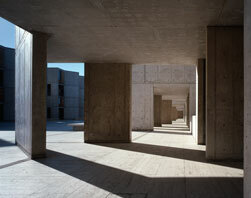 While on assignment to document a new addition to the Salk Institute for Biological Studies in La Jolla, California , Scott enjoyed unprecedented access to photograph the original Salk Institute buildings. The result is a series of captivating images that reveal the timelessness of this architectural masterpiece designed by Louis Kahn in 1962. 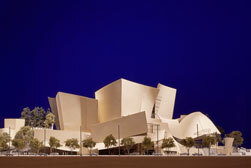 Scott was commissioned by Frank Gehry to create portraits of architectural models during the period in which Gehry was fast becoming an internationally famous architect. The architect sketched his embryonic designs in abstract and fluid squiggles on paper from which scale models were created. He used these three-dimensional renditions to refine his sculptural designs until he was satisfied, at which point professional model makers built a sophisticated scaled replica of the building suitable for exhibition and publication. This unique model train layout was a three dimensional storyboard created by a scriptwriter, Edward Kutner, with help from a Hollywood set designer as an exercise for imagining characters and plot. Scenarios were fashioned within the layout from which a narrative could be drawn. The resulting script was optioned by 20th Century Fox which suppressed its development because of similarities to the film ‘Speed’ which was currently in production.